Of course, the Patriarchy is at least partially to blame. Men tend to die earlier than women, are more likely to die from eight out of the ten top causes of death in the U.S. than women, and are also more likely to smoke and drink excessively. Researchers think a mix of factors are involved in men's earlier deaths, including the fact that men tend to take more risks, are less socially connected, and have more dangerous jobs than women. But there's another very simple, easy to fix problem: Men just don't go to the doctor as much as women do. Men are half as likely as women to go to the doctor over a 2-year period, according to 2014 survey data collected by the U.S. Centers for Disease Control and Prevention. They were also more than three times as likely to admit going more than five years without a visit. And finally, men were more than twice as likely to say they’ve never had contact with a doctor or health professional as an adult. Ever. A new online survey commissioned by the Orlando Health hospital system hints at why men may be so reluctant to see doctors. According to the survey results, a mix of busyness, fear, shame and discomfort kept them out of the doctor's office. The Orlando Health hospital system commissioned Harris Poll to conduct the survey to raise awareness about men’s health issues during National Men’s Health Week. Dr. Jamin Brahmbhatt and Dr. Sijo Parekattil, two men’s health activists who founded Orlando Health's Personalized Urology & Robotics Clinic, are taking the results of the survey on the road to encourage men to face their fears about the doctor and make a call that could save their life. Called “The Drive For Men’s Health,” the doctors are currently on a 10-day, 6,000-mile trip across the country to motivate men to start taking their health seriously. It's the third time they've taken their message on the road. Dr. Sijo Parekattil and Dr. Jamin Brahmbhatt show off their muscles and combined 90-pound weight loss in a photo to promote the 2016 Drive for Men's Health. Like the men he’s trying to reach, Brahmbhatt confessed he has some of the same fears and insecurities that hold people back from a trip to the doctor’s office -- particularly fears about the rectal exam or being naked in general. As a doctor getting healthcare from the hospital he works in, Brahmbhatt owned up to nervousness about the fact that he was going to appear sans pants in front of a colleague. "You’re getting some of the most sensitive parts of your body examined" he told The Huffington Post. “But we, as physicians, are very [aware] about the sensitivity in some of these private organs, so we’re not out to hurt you." There's also no doubt that these checkups can save lives. One of Brahmbhatt's patients, a man named Steve, was in model shape because of his job as a firefighter and commitment to exercise. But when Steve noticed a bump on his testicle, he chose to ignore it at first. And when he finally did show up at the office, Brahmbhatt examined the bump, ordered tests and eventually diagnosed him with testicular cancer. “If he had waited another six months or a year, it would have definitely spread to the rest of his body,” Brahmbhatt said. 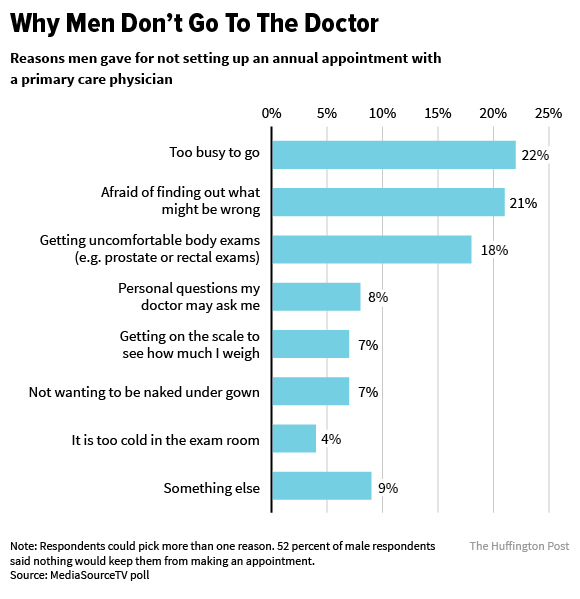 How often should a man go to the doctor, anyway? Men ages 18 to 39 should have their blood pressure checked every two years, but if it reaches a certain threshold, it should be checked yearly. Men ages 45 and older should be screened for diabetes every three years, but if they are overweight the screening should start at a younger age. Men over age 35 should be screened for high cholesterol and heart disease prevention every five years, but if they have diabetes, they should be screened more often. Men with no family history of colon cancer or polyps should be screened for colorectal cancer every five to ten years between the ages of 50 to 75, but the screening should start earlier if they do have a family history. No matter what your age, if you haven’t been to the doctor as an adult, go as soon as possible, Brahmbhatt said. Together, you can work on a schedule for preventive screenings and doctor’s visits tailored to your age and health in order to protect what he called your most “priceless possession." “You can’t go rent another body and you can’t go use someone else’s body,” Brahmbhatt concluded. “It’s all you have, so why not take good care of it as you do everything outside your body that has a price tag?" Men experience very strong, clear messages about how they’re supposed to display their masculinity and hide their vulnerability, and pretty much everything about going to a doctor’s office goes against these rigid gender role norms, said professor Glenn Good, an expert on masculinity and the psychology of men at the University of Florida. Good was not involved in the survey, but said that the results did not surprise him. And while the face of body shame might be female, as women come under extraordinarily heavy criticism for their looks and weight, that doesn’t mean men don’t struggle with other expectations of what their bodies should look like. This could explain some men’s reluctance to find out their weight in the doctor’s office, Good said. Men need to re-think their idea of strength if they want to feel comfortable about going to a doctor, he advised. A truly strong, healthy person embraces routine health care, health consultation and daily healthy habits to truly protect his body, Good said -- not just his own self-image. “The metaphor of a tree is a helpful one,” he said. "A truly strong tree can flex and bend in the wind, but a tree that is really rigid and stiff is more likely to get snapped." Do you avoid going to the doctor? Tell us why. Men are two times more likely than women to say they’ve never had contact with a doctor. Why, guys? Graphics by Alissa Scheller for Huffington Post.